Are you a restaurant owner? Are you opening a bar? Have you heard of Chef’s Deal Restaurant Equipment before? If you have, then you’re in the right place. What you may not know, however, is that CDRE also has restaurant furniture for you. Below, you can read all about it! Let’s start with the seating. 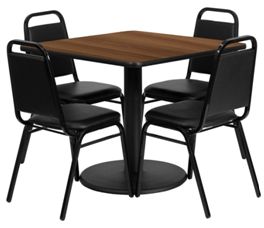 You can get a variety of seating options at Chef’s Deal Restaurant Equipment. You can buy anything from dining chairs, stacking chairs, bar stools, folding chairs, high chairs, to chair dollies. People often overlook how important it is to have good seating when you own a bar or restaurant. When your customers come to your business, they need to be comfortable while they wait for their food to be prepared. If they don’t have a seat that they can sit comfortably in, then they are likely to give your business a bad review. A good seat, however, will increase the good feedback you receive and will improve quality of the word-to-mouth comments that are spread about your restaurant. There are also dining room booths for you to buy. The very best restaurants have booths that groups can sit in because it’s more comfortable. You can select from all of the products that we have in stock, from the basic to the luxurious. If you’re starting out on a budget, then you should consider going for our more inexpensive prices, which range from under three hundred dollars and more. More than anything, we recognize that you need restaurant furniture that matches the overall style and essence of your restaurant. If you’re running a very zen restaurant then you most likely won’t want to go buy flashy orange chairs, which is why you’ll love all of the choices we have available for you. You can buy furniture with the confidence that you’re furnishing your restaurant at the lowest price possible. Because of how much money you’ll be saving, you can spend on other areas. There are some distributors that will sell you equipment at a cheaper price, but they’ll sell you furniture that isn’t of lesser quality as well. Chef’s Deal Restaurant Equipment won’t ever do that to you. Here, you can have complete confidence that we will provide you with everything you need to start your business properly, and that you’ll be able to do what you love for a living. Are you opening a restaurant? Are you a business owner? Do you want to open a bar? No matter why you’re here, it’s good that you are. Here at Chef’s Deal Restaurant Equipment, you can buy anything from chairs to tables so that your restaurant looks as good as it possibly can for your opening day. It can be hard to choose which pieces of furniture to choose from; so, by all means, you can stop by one of our stores to get an employee’s opinion. Otherwise, get to shopping online!